All Posts Tagged With: "Strategy 31"
A member of the Other Russia party says he was threatened with deportation, problems with his job, and the possibility of losing his family if he didn’t become an FSB informant. Two prominent Russian oppositionists have been fined for violating rally regulations according to a new law that severely increased respective penalties; neither can afford to pay them. Political prisoner Sergei Mokhantkin has been released from holding in a penal colony after being pardoned by President Dmitry Medvedev – nearly two years into his 2.5 year sentence. A year and a half after closing the square for construction that never took place, Moscow city authorities say they’re reopening Triumfalnaya Square for rallies and other public gatherings. 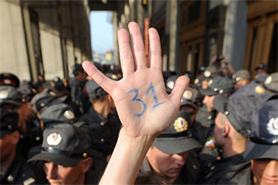 Dozens of people were arrested at Strategy 31 protests across Russia on Wednesday, with at least one severely beaten and two regional leaders facing possible severe political persecution. Authorities in Moscow and St. Petersburg have once again refused to sanction Strategy 31 rallies in their cities; oppositionists intend to protest in defense of free assembly regardless. Organizers of the Strategy 31 opposition campaign say their next rally will take the form of a sit-in. Political activists looking to hold protests in Moscow are facing increasing opposition from Mayor Sobyanin, who says that city streets and squares should be closed off for demonstrations only if they consist of many thousands of people. Opposition activists across Russia held rallies in defense of free assembly on Tuesday, with dozens detained in Moscow, St. Petersburg, and other cities.